If all 47 million food stamp recipients voted for President Obama, it would account for 75.4 percent of Obama’s 62.3 million votes. Harry Hopkins, FDR’s close adviser who ran the WPA, once described Roosevelt’s strategy as “tax & tax, spend & spend, elect & elect.” He believed that if Roosevelt put everyone on the federal payroll, either through aid or federal jobs, that Rooselvelt would never lose. FDR won four presidential elections in a row before his death removed him from office. Did Obama use his idol’s model to win this election? 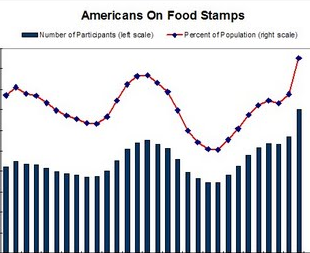 Food stamps rolls have grown nearly 50 percent””by more than 15 million recipients (up from 32 million)””under the Obama administration. During that same time, the unemployment rate has stayed the same. Either those outside of the workforce have been decimated by the Obama economy or this administration is making a conscious effort to get more Americans reliant on government. Or both. Welfare programs now cost taxpayers a record-high $750 billion. While government “charity” has grown, so has poverty””and so has the Democrats’ poll numbers. Not everyone on food stamps votes or votes Democrat (and no one polls this subset of the population), and I don’t want to overstate the effects of the growth in welfare. But, if citizens vote in their own personal, short-term interests, with 49 percent of the population receiving some sort of federal aid, Republicans will never win another election. Thankfully many of those 49 percent are elderly voters who want a bright, debt-free future for their children. While liberals throw federal money at voters, conservatives must offer them something more substantial. It’s tough to beat politicians handing out free stuff, but we have to hope that careers and purposeful opportunity will appeal to American people’s ethos. Ron Meyer is the press secretary and spokesman for American Majority Action. He’s appeared frequently on Fox News, CNN, the Sean Hannity Radio Show, and the Mike Huckabee Radio Show.